Here it is again, my favorite at the moment paper. Who would have thought one 12 X 12 sheet of paper would go so far(there's still a little left), it's at Gotta Scrap in Rockwall, Tx. You'll have to click on the picture to see the embossing on the brown card stock, it's very subtle. I got my sketch from Sweet Sunday Sketch Challenge and my color combo from Dannis Dreams Crafts and the 3rd challenge I'm listing is for CCEE Stampers, their challenge is for a Summer Fun card. I've said before we're not beachy or pool people anymore. 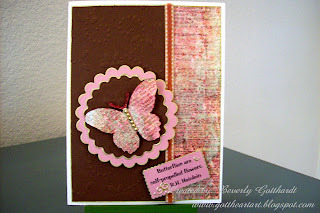 So, I thought I would do a little different take on summer fun with a pretty glitter butterfly. My computer is right by a front window that I look out on a flower bed. This year I've had butterflies and Mom and Dad mockingbirds coming to sit on my wrought iron heart fussing at my cat through the window. That's been a fun thing to watch. They've made my cat a nervous wreck because she can't get out there to get them. Supplies: Card Blank-Ivory 5" X 61/2" Value Pack Hobby Lobby, brown card stock from my scrap box, pink pearl card stock-Pearlescent Paper Pack Wal Mart, Iron Orchid Designs-Flirty Little Secret Shimmer paper, Sharpie Poster Paint Pen-Gold, ribbon-Hobby Lobby, CTMH marker-parchment, Cuttlebug Cut and Emboss-Butterflies, Spellbinders Nestibilities-S4 124 Classic Scallop Circle Lg., Stampin Up-Sizzix texture plate-Eyelet, computer generated sentiment, gold dot stickers, Starform Outline Stickers, brown Sharpie marker, pop dots. This is just gorgeous!! Love it! Thanks for playing along with my flutter by challenge!! Beautiful! Thanks for playing in the CCEE challenge. this is a sweet card - I didn't follow the challenge - think I am a week behind. Very cute! Loving that paper too! What a beautiful little card! Such summertime fine! Thanks for playing along today!